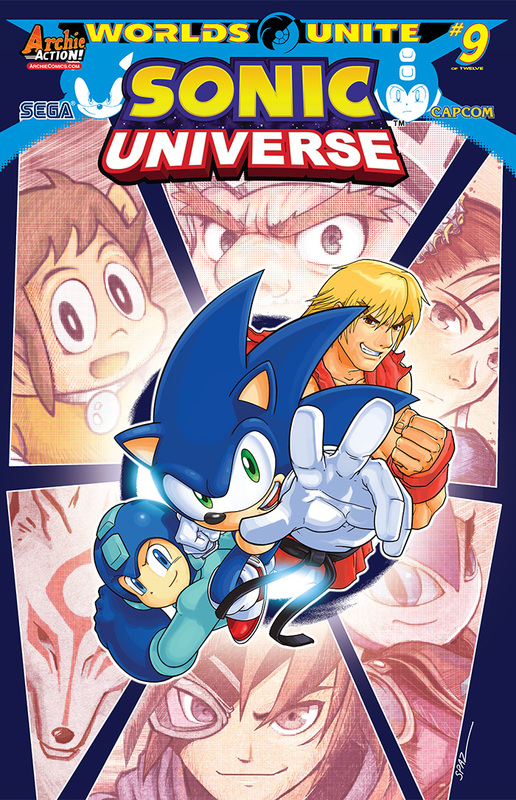 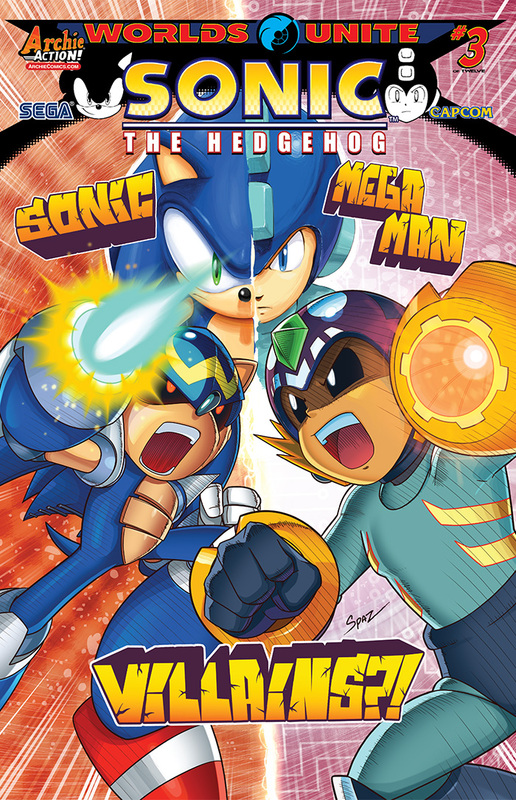 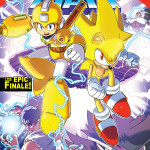 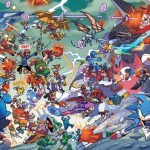 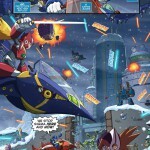 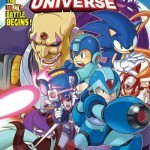 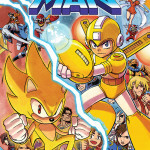 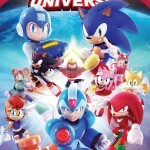 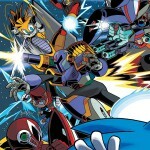 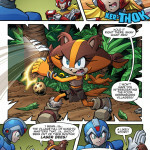 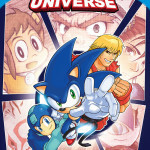 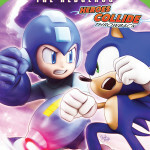 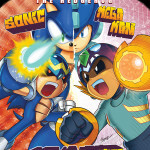 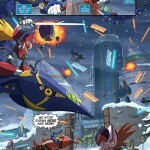 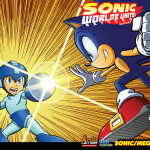 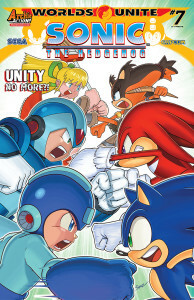 After months of hype, the crossover between Sonic, Mega Man and a slew of other branches is finally on our doorstep! 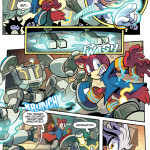 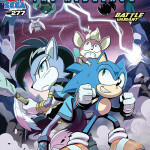 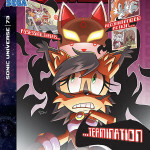 Destructoid have conducted an interview with writer Ian Flynn regarding the behind the scenes of it, and with it a preview for Sonic Universe #76 is also provided. 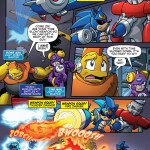 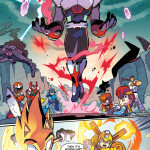 Dreaded Maverick Sigma manages to make his way to the Lost Hex in Sonic’s World, and the first port of call is enlisting the Deadly Six to his side by promising more power than Eggman can offer. 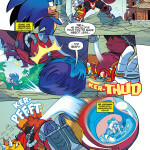 This can only end badly for the good doctor, and it’s not much better for our two blue heroes as their heroic duties are halted by a disastrous ambush! 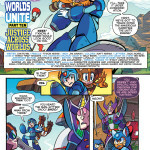 It all kicks off in “Worlds Unite”: part 1. 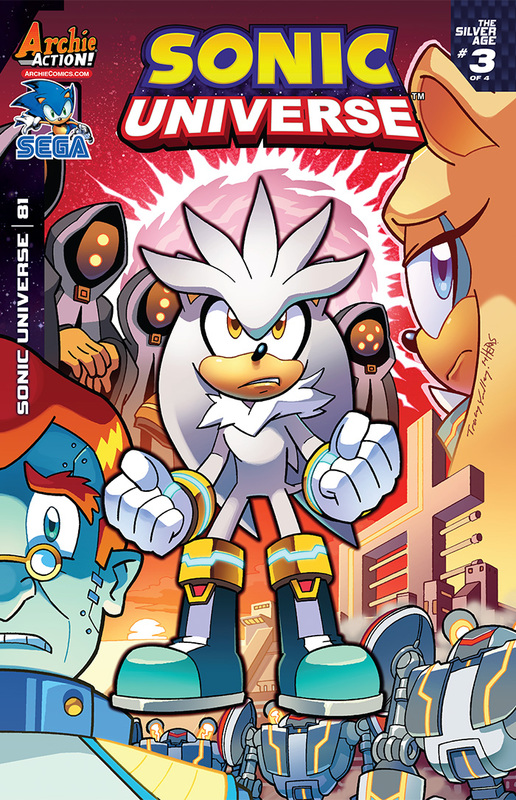 Sonic Universe #76 should be out in all good comic stores and on digital formats tomorrow. Remember that there should be a new comic coming out almost every week (save for five week months where there’s a week of no comics), so we’re going to be accelerating through this story! 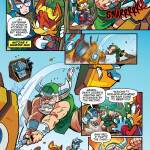 We finally get the missing piece of the story puzzle for this week’s comic preview! 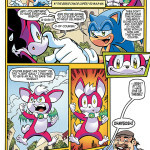 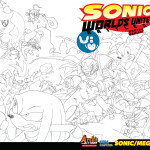 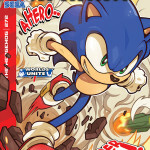 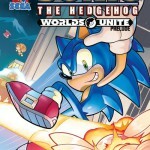 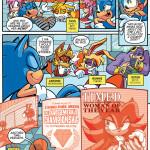 This is the last Sonic issue before we unite for the worlds crossing over, and Arcade Sushi delivers a hint of the story that lies between Sonic Comic Origins #6 and Sonic Universe #75. 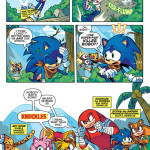 In Sonic the Hedgehog #272, Sonic and the Freedom Fighters finally make it to Apotos with Knuckles and Chip in tow. 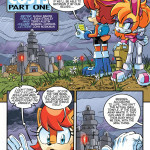 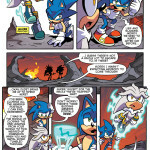 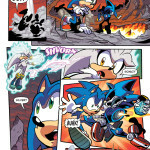 Sonic and the light Gaia head off to find their first Gaia Gate to figure out how to restore their shattered planet. 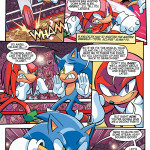 But there’s plenty of signs that a certain metal somebody is back for revenge against the blue blur! 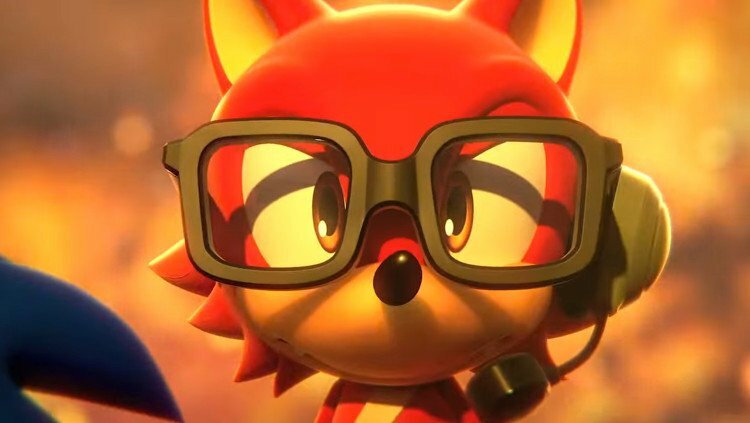 And the Freedom Fighters aren’t exactly throwing tea parties for Knuckles when they come face to face with a titanic force…dare I say of a Dark Gaian nature? 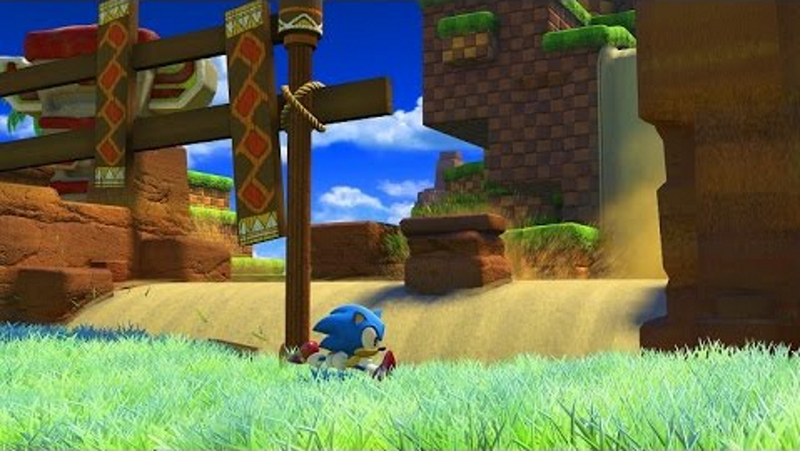 This is ” A Ray of Hope”. 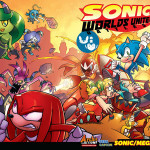 Time is up—the WORLDS UNITE crossover event is almost upon us! 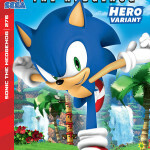 “A Ray of Hope”: As Sonic and the Freedom Fighters continue their journey to save the shattered planet, Sonic and Chip journey to Apotos to uncover the secrets of the Gaia Gate! Meanwhile, Knuckles and the Freedom Fighters take on a TITANIC challenge of their own! 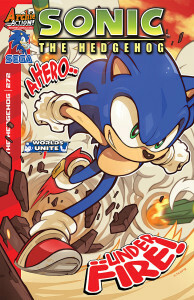 Does Sonic have a hope in saving the world? 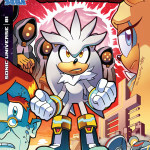 Will battle tear the freedom fighters apart first? Find out the answers to these and more exciting questions as our heroes journey to the much-awaited crossover event of the year—WORLDS UNITE! 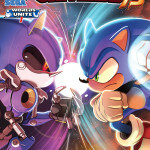 Featuring new cover art from Edwin Huang (Uncanny Skullkickers) and a crazy-new Metal Sonic game art variant provided by Sega! 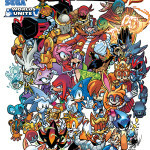 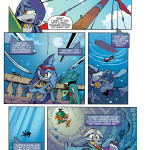 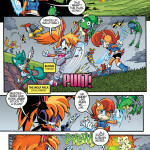 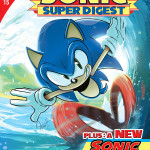 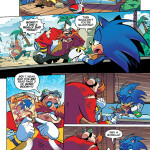 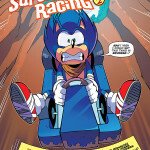 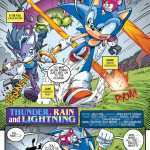 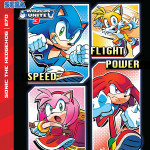 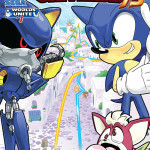 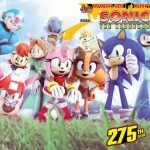 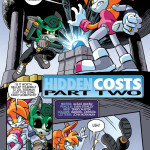 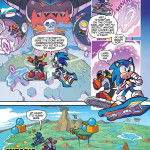 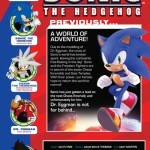 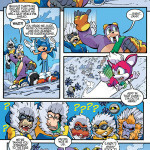 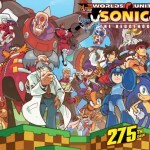 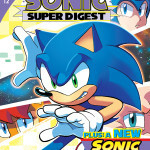 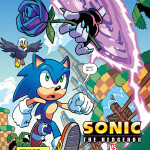 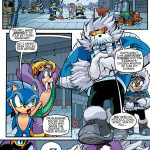 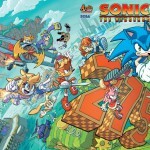 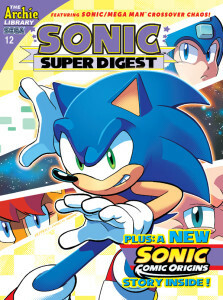 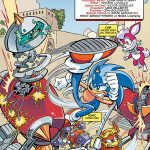 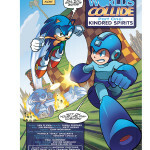 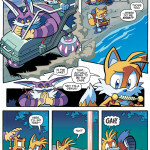 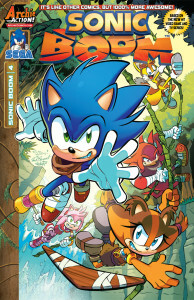 On Sale Date: 5/13 | 32-page, full color comic | $3.99 U.S.
Sonic #272 is scheduled for release this Wednesday. 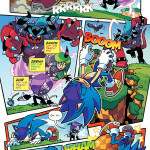 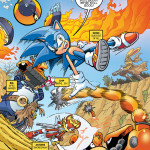 Enjoy the calm calamity while you can, because it all kicks off in the next Sonic comic release! 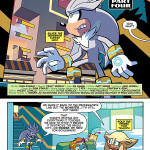 It’s a race to rescue…the fourth wall. 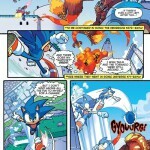 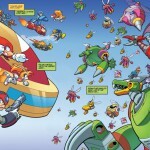 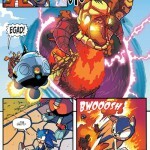 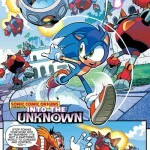 Sonic Boom is revving straight towards the crossover, and Comic Book Resources has a preview for it. 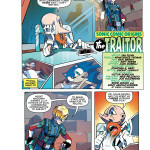 Following on from last issue, Sonic is in peril as Eggman sprung a trap on him when that is cheating, who’d have thunk it. 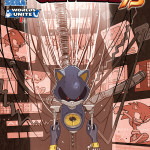 After being helped out, Sonic makes it his mission to win fairly and show up the doctor, but he has to survive the rest of the course in order to do that. 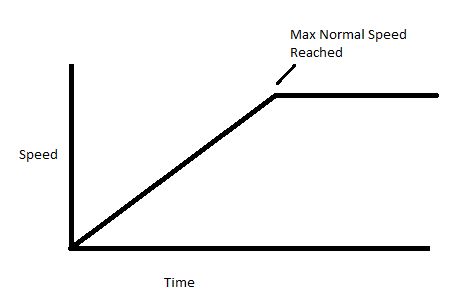 And while we’re here, what will Sticks come across away from the races? 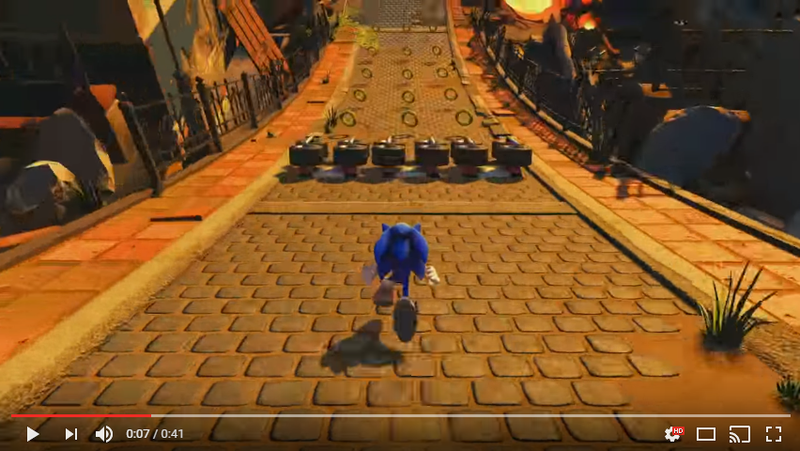 This is “Everybody’s Super Sonic Racing”: part 2. 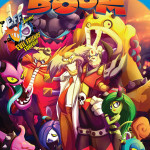 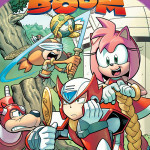 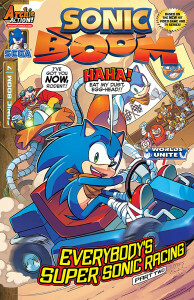 Sonic Boom #7 is already out in comic stores and on digital formats. 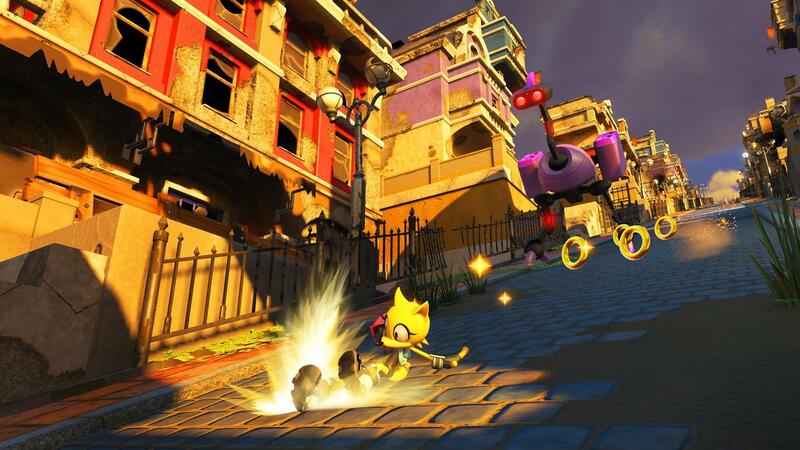 As long as your commute to the shops isn’t as deadly as Sonic’s you should be fine. 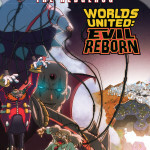 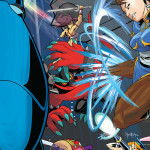 Worlds Unite creeps ever closer with the free prelude AND a sneak peek at part 1. 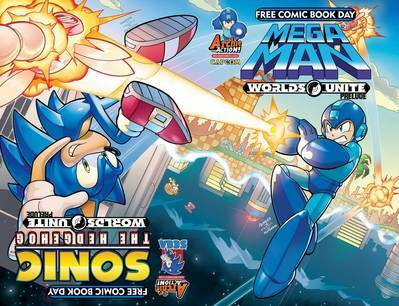 Remember to set your alarms for early; Free Comic Book Day is tomorrow, and no doubt people will be snapping at the heel for free goodies. 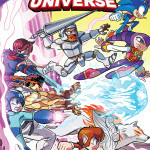 In honour of the occasion, IGN have interviewed new editor Vincent Lovallo regarding Worlds Unite. Lovallo speaks at length about the behind the scenes of getting so many familiar faces together, the prelude story included in the FCBD issue, how some thing will be running down in the crossover itself, and even hints at the wake that follows! 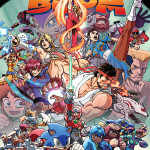 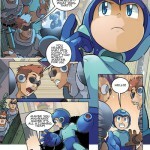 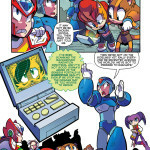 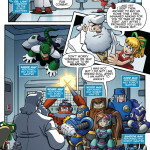 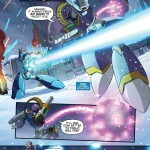 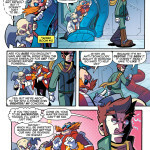 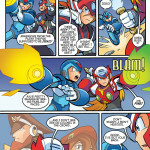 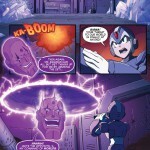 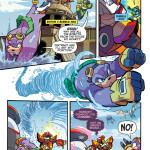 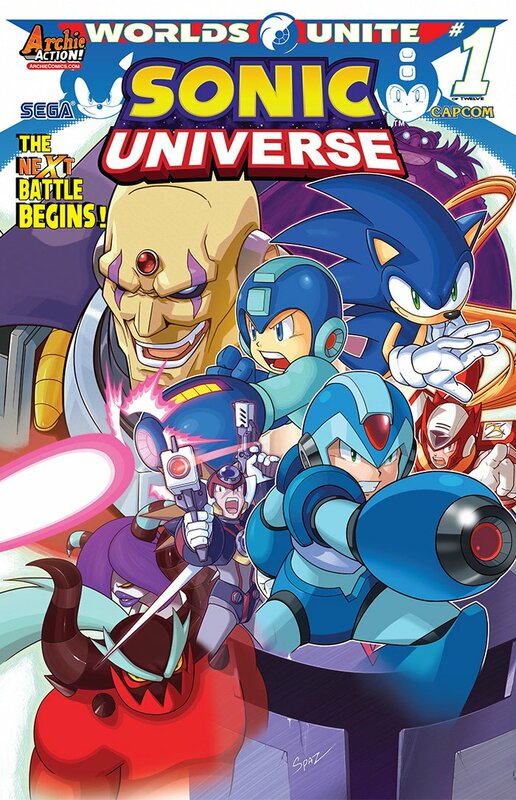 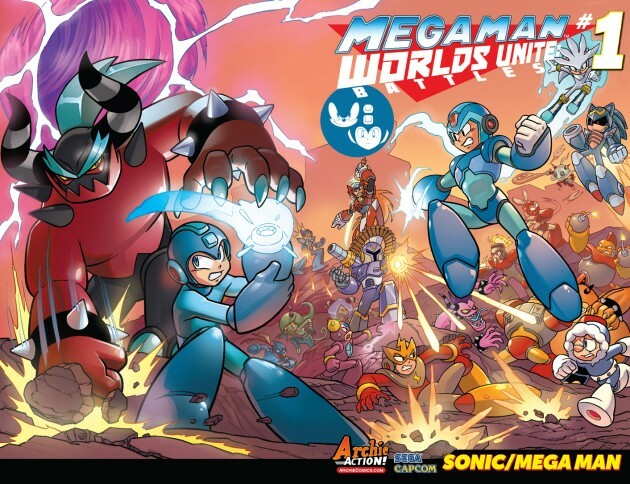 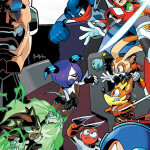 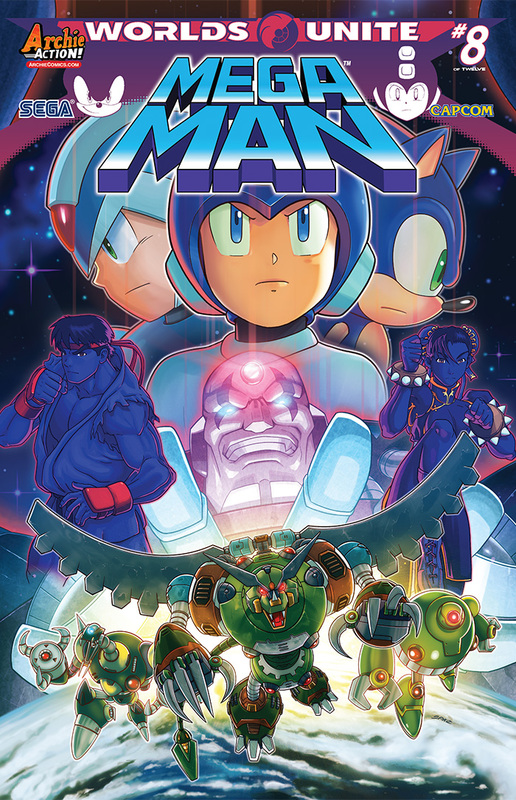 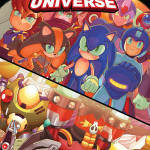 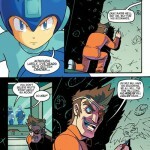 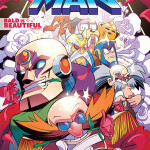 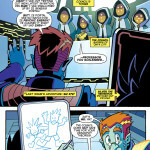 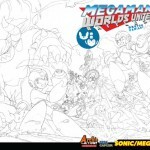 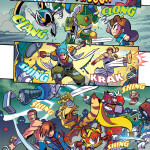 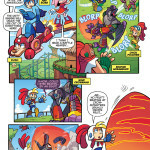 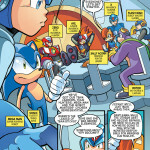 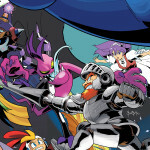 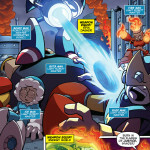 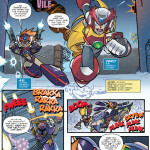 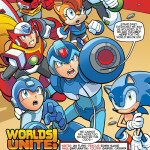 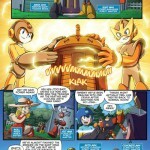 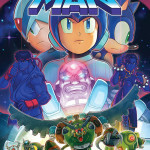 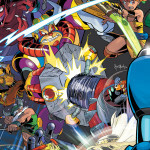 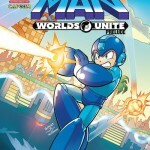 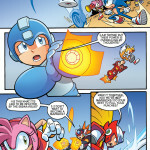 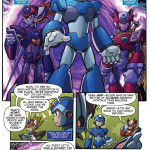 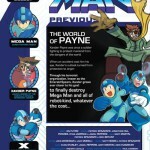 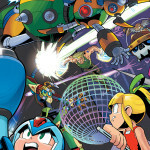 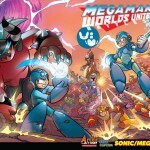 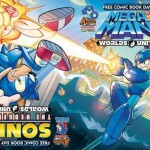 If that wasn’t enough to get your appetite going, there’s a preview for the Free Comic Book Day issue for both sides of the book, where we reflect on the path worn for Mega Man to reach this point and begin to learn about the Genesis portals that are so integral to the events of Worlds Unite. 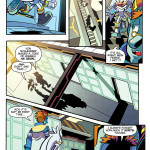 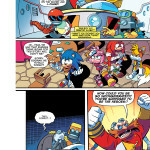 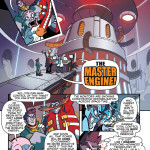 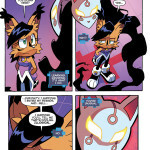 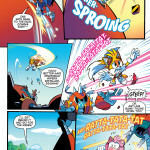 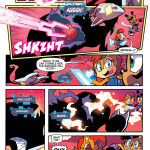 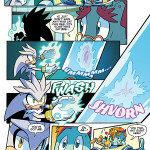 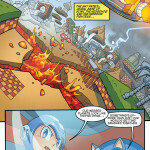 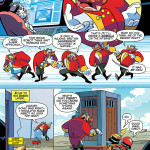 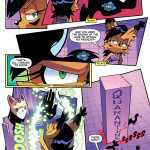 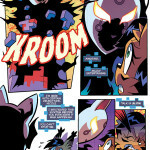 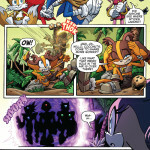 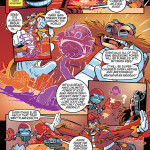 Not only that, but there’s a sneak peak at part 1 of the main event with some pages from Sonic Universe #76! We will have even more on the start of Worlds Unite closer to its release in about three weeks time. 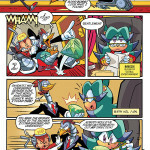 In the meantime, plan according to snag your copy of the FCBD issue. 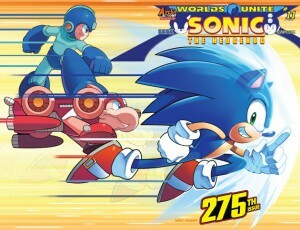 Me, I’m already routing my bus times to compete with the comic runner in the Roebuck for my issue. 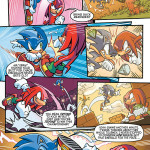 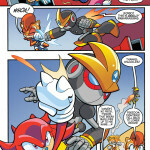 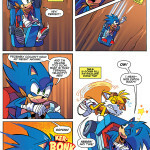 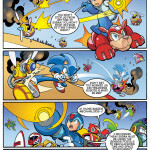 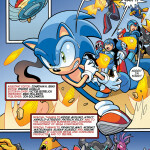 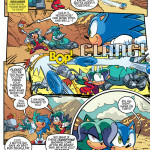 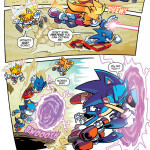 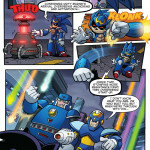 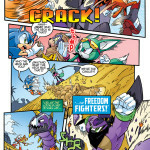 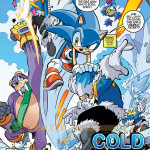 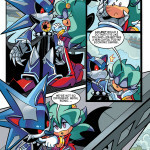 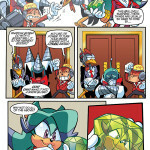 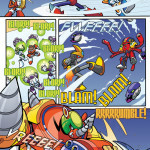 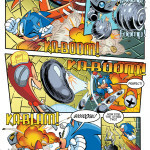 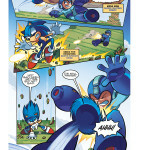 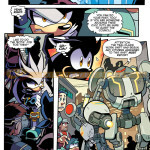 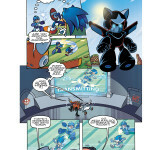 Sonic and Metal Sonic duke it out in this milestone issue of the side comic! 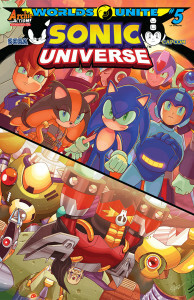 Newsarama is where we’re looking to for the preview for this occasion, and we’re rushing into the crossover head-first! 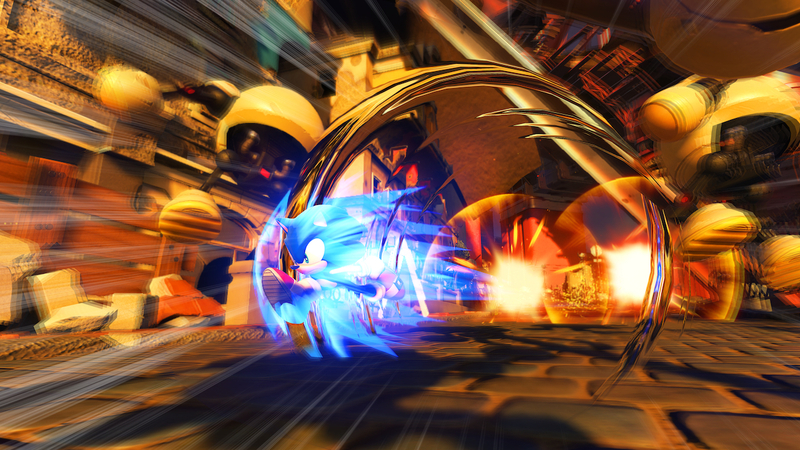 Sonic is on the pursuit as Metal Sonic comes with attack on the mind and a Chaos Emerald in his possession. 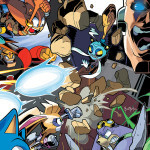 But this mutual beatdown can’t stay within the confines of just one place; thanks to the Genesis Portals, it’s going all over, to places unknown! 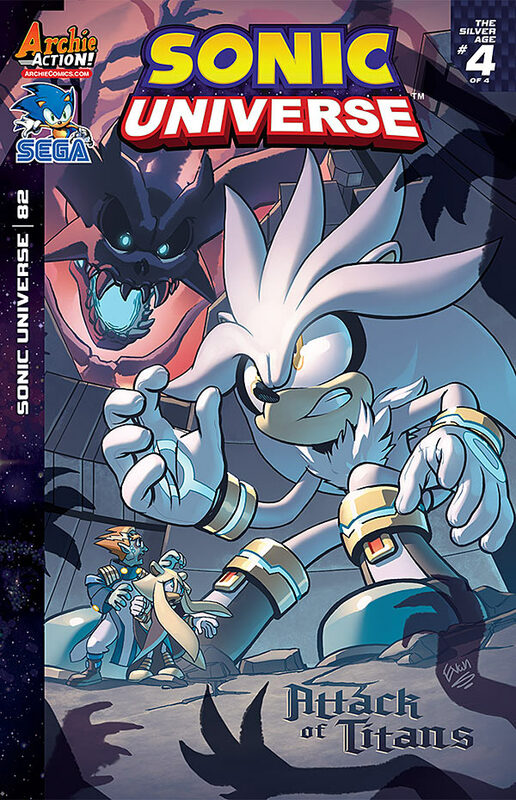 Teaming up with Silver, who has made it his quest to close the portals, can the two bring down Metal Sonic long enough to get that Chaos Emerald back? 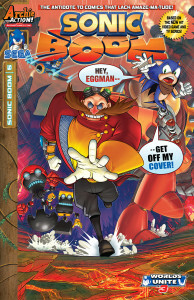 And what sinister forces are at play while Eggman isn’t looking? 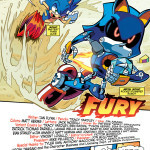 Find out in “Fury”. Sonic Universe #75 is already out at all good comic stores and digital formats. 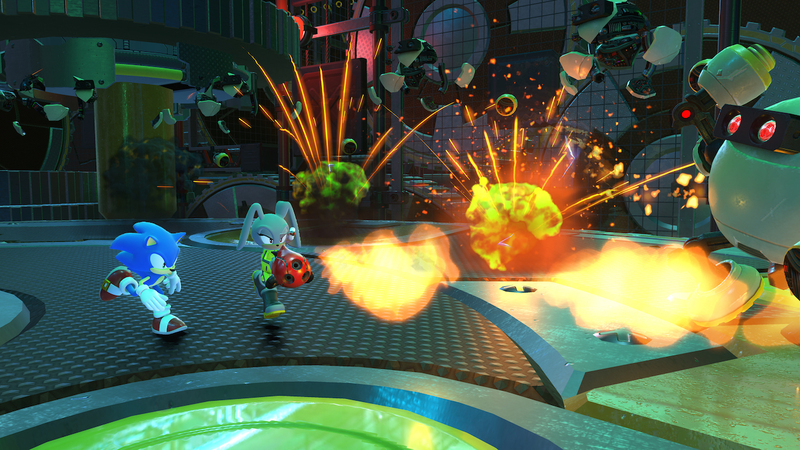 Engage thrusters to enter Worlds Unite on high velocity! 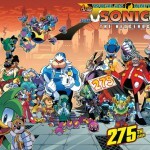 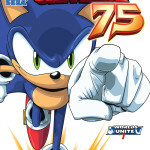 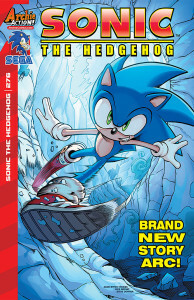 NB: Sonic Universe #75 is set after both the Free Comic Book Day issue story and Sonic the Hedgehog #272. 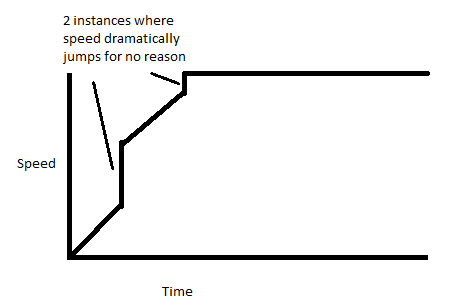 Just for those keeping track at home. 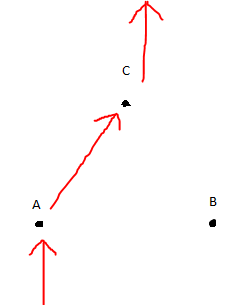 I wonder if Ant and Dec would have been up for doing some of their schtick for Breezie. 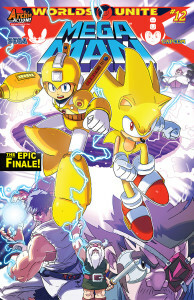 The final round of the current arc is about to commence, and Comic Book Resources is providing pre-match commentary. 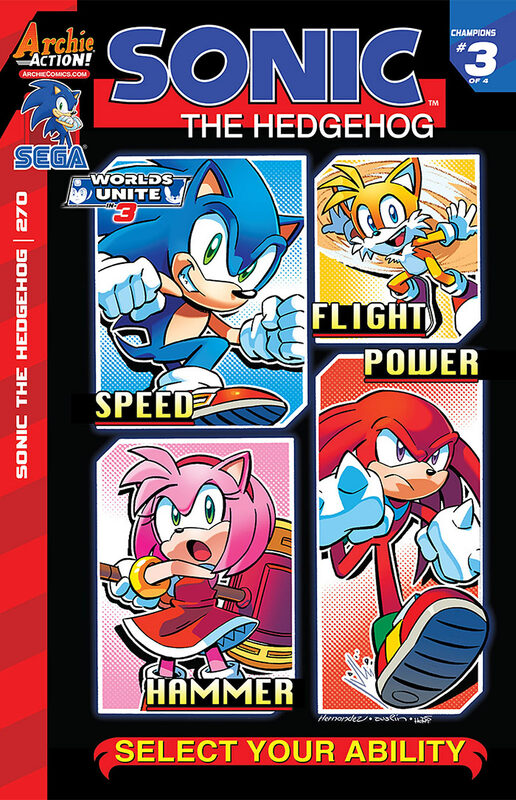 It all boils down to the final two competitors, Sonic and Knuckles. 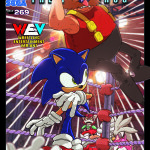 Both have good reason not to lose this match, but they’re not going to hold back for this spectacle! 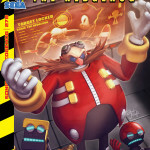 While they fight for the fate of the world though, the Hooligans are still at large and set on carrying out Eggman’s orders, and Metal Sonic is en route to become a wild card in the fray too! 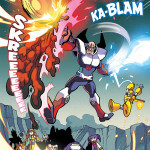 Can the heroes finish the match and fend off the attack? 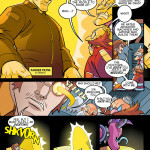 Find out in “Champions”: part 4. 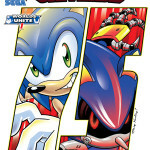 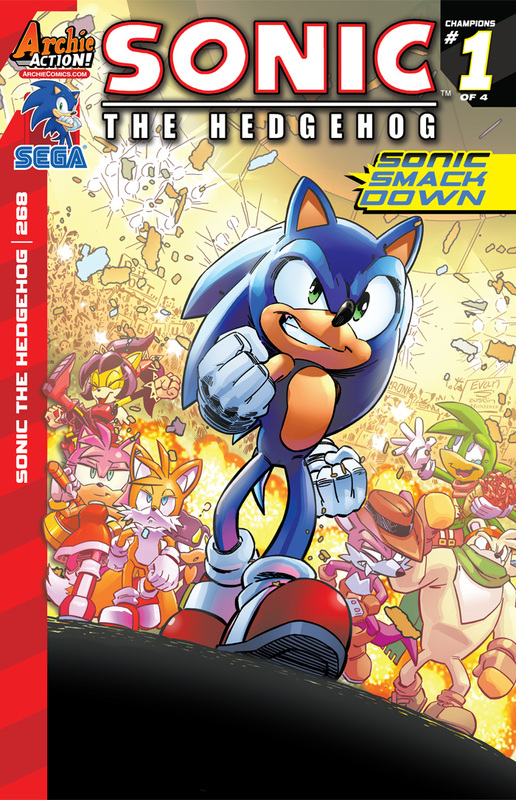 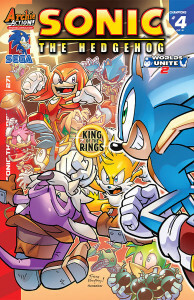 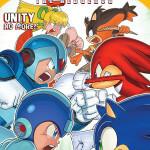 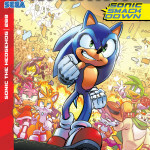 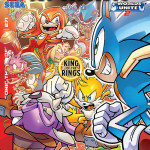 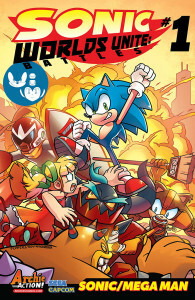 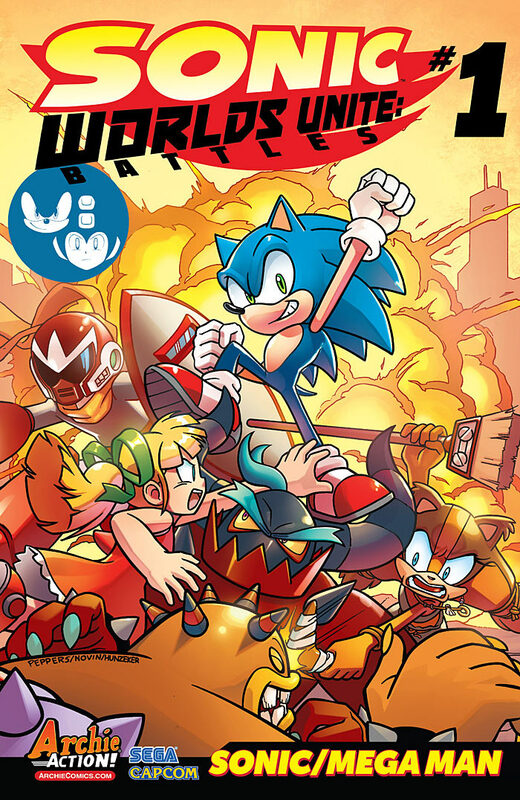 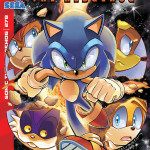 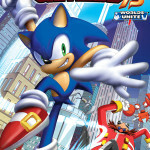 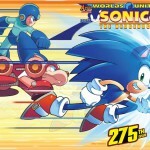 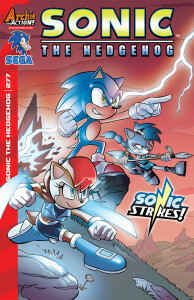 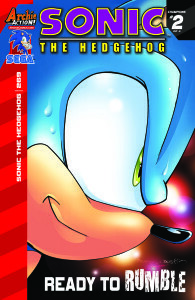 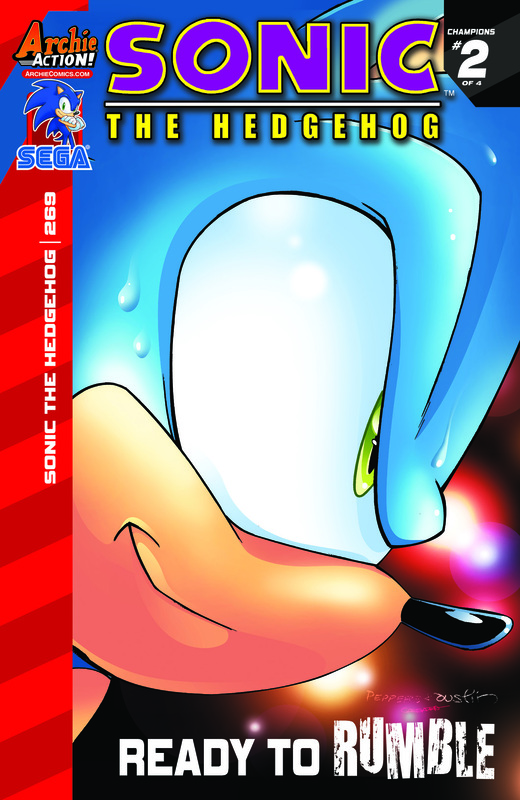 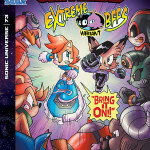 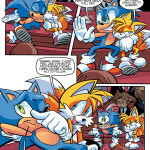 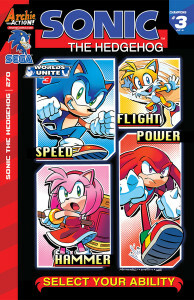 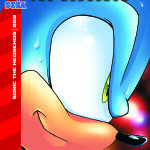 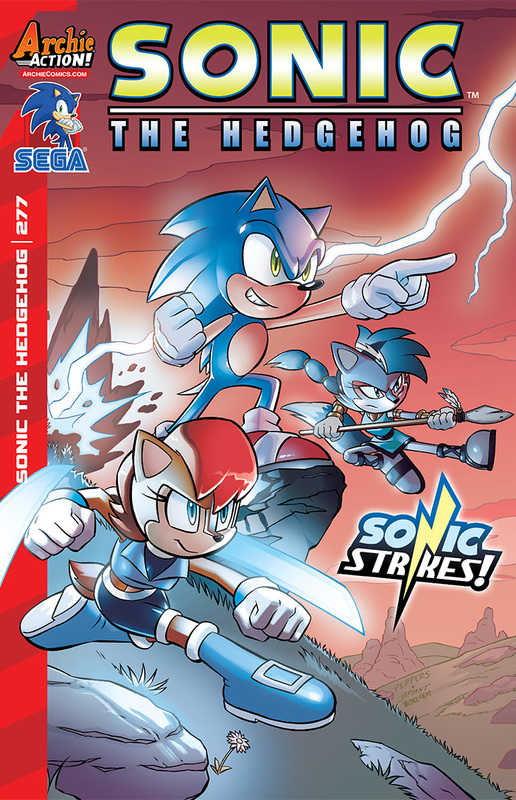 Sonic the Hedgehog #271 is slated for release later today, don’t get beaten to the punch for this knock-out finale! 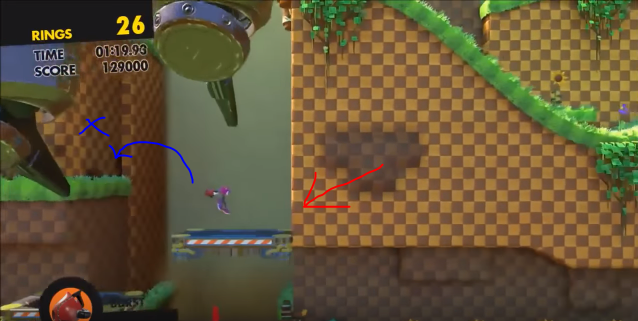 I much prefer Reactive Factory’s music, thank you. 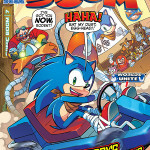 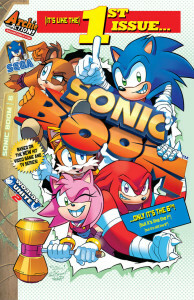 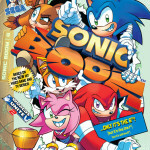 Comicbook.com has the preview for Sonic Boom #6 (not the first issue as the cover would lead you to believe), and it’s a quaint day at the races for our heroes…on paper. 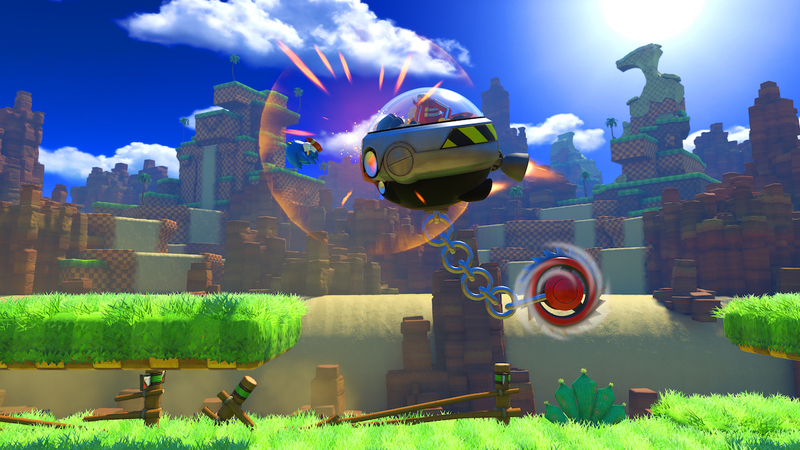 But when Eggman challenges Sonic to a race in go-karts, no amount of rules like no powers and no robots or weapons will shake off the feeling that there’s something off about this particular drive. 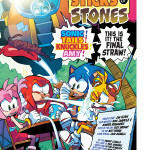 And where is Sticks going exactly? 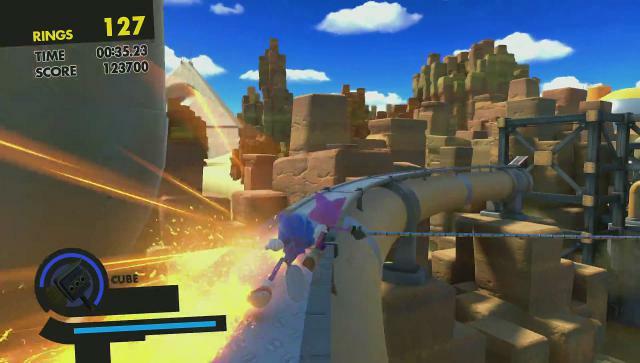 Perhaps the answers will lay in “Everybody’s Super Sonic Racing”: part 1. 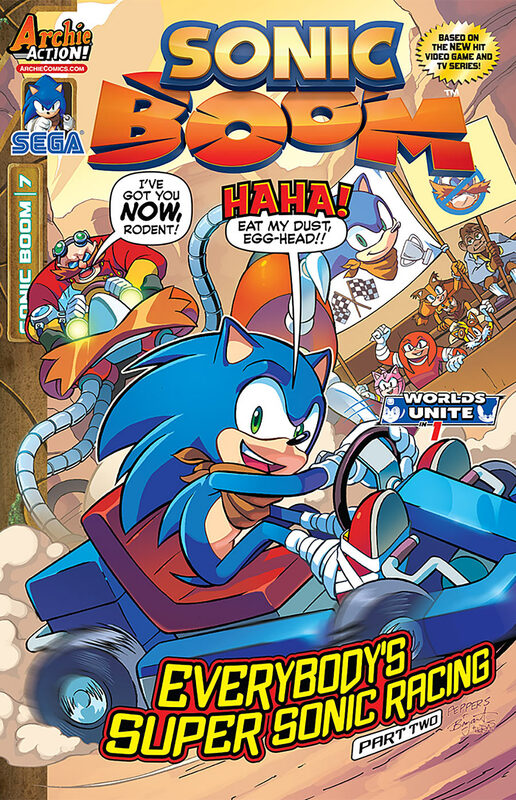 Sonic Boom #6 is scheduled for release later today, although I don’t think you’ll have quite as much of a perilous commute for it. 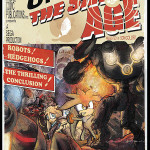 What better way to bring us back to the present than with the finale of the technological terror! 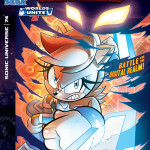 Comicbook.com has the preview for Sonic Universe #74, and there’ll certainly be sparks flying! 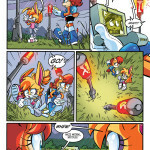 Sally, having subjected herself to the digitiser, is now fighting alongside Nicole against Phage for the fate of the Digital World. 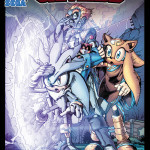 But it’s not just data in peril as Tails, Big and Dr. Ellidy are all under attack from Phage’s influence from the outside. 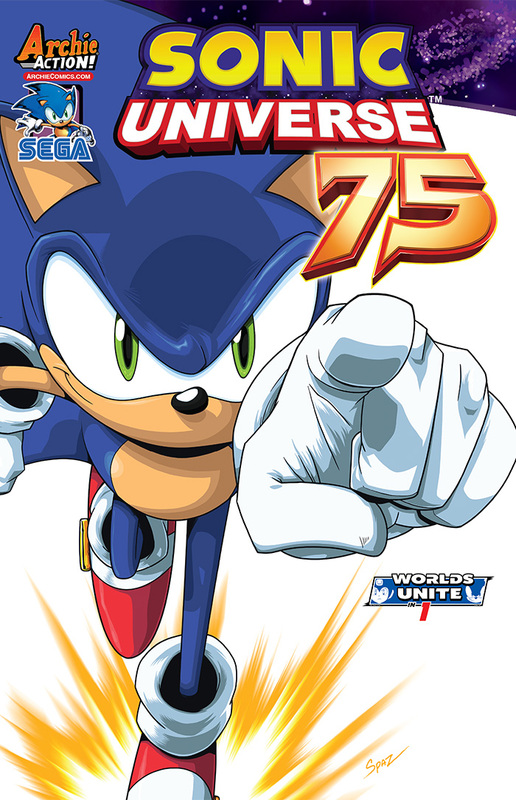 To beat this monster will require wit, strong friendship and something a little extra, otherwise they’re doomed to be done in by the past. 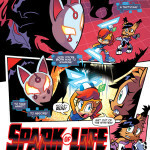 See how it all comes to a close in “Spark of Life”: part 4. 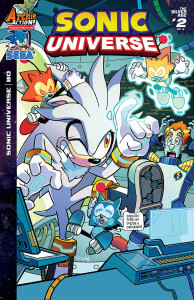 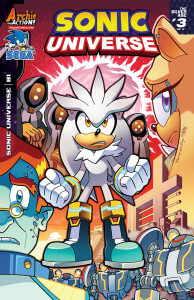 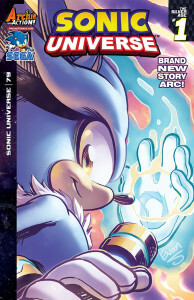 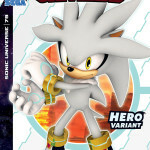 Sonic Universe #74 came out today in comic stores and on digital formats. Get it today and complete the story circuit for yourself! 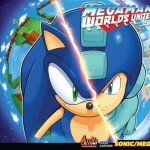 Worlds apart, they couldn’t be more opposite if they tried. 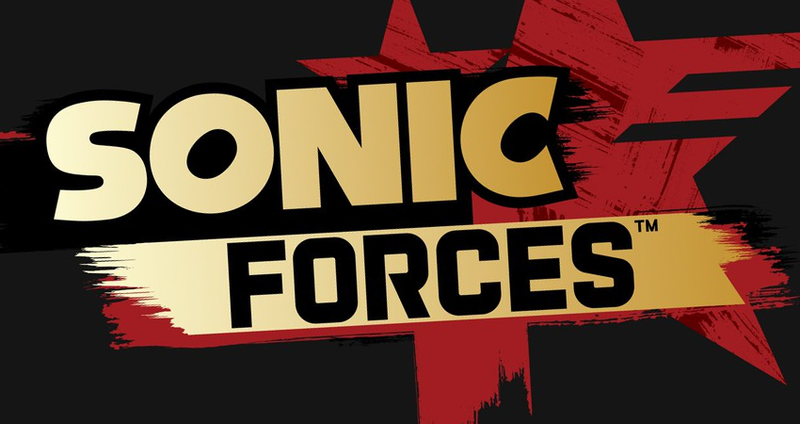 Well, haven’t the last few weeks been interesting. 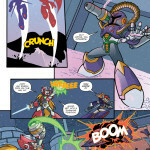 SSMB has been down (and undergone a slight time warp), and a few technical hiccups have delayed these comic updates. 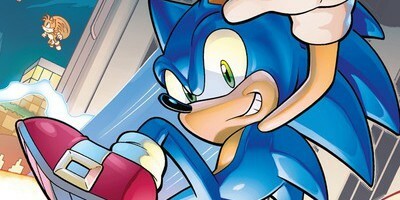 But now we’re aiming for the right track with a catch-up on what’s gone down. And as luck would have it, we got a very rare occurrence; two comics came out on the same day! 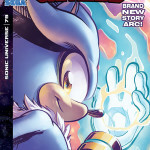 Comic Book Resources has the preview for Sonic #270. 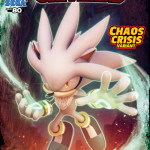 The Chaos Emerald Championship draws on, and more big names bite the dust. 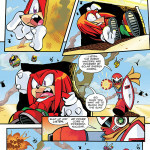 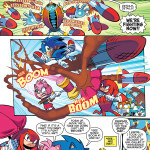 Amy takes on Knuckles as he goes about his mission, Sonic tackles the mischievous Honey, and the Hooligans are still running about like loose cannons. 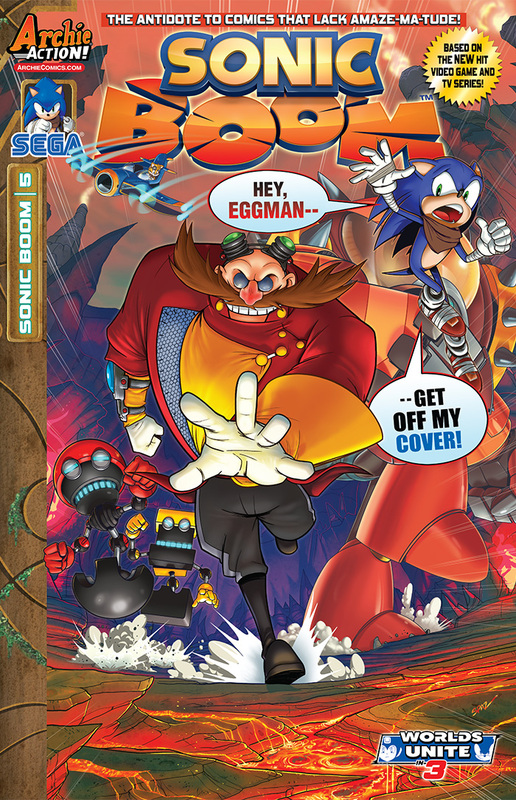 But things aren’t as straight forward as they look on the surface, there’s treachery afoot, and it has Eggman all over it, and there’s more shade about Breezie’s past than one would think! 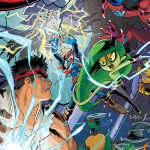 All this fights its way into “Champions”: part 3. 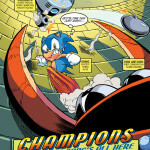 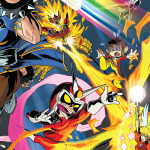 “Champions” Part Three: The battle for the Chaos Emerald is reaching a fevered pitch! 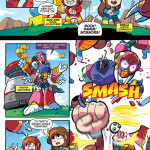 Hero versus hero! 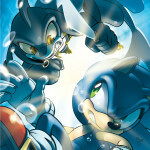 Villain versus villain! 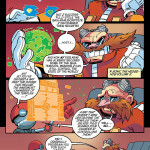 Will Dr. Eggman be content to play by the rules? 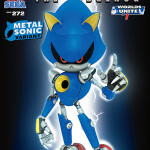 Will Metal Sonic come in and shake things up? 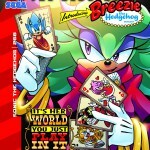 And what exactly is the secret history between Metal Sonic and casino mogul Breezie?! 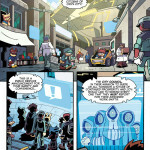 All of the answers await you in this thrilling, penultimate chapter! 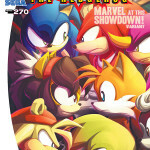 Featuring all-new cover art from one of the newest Sonic superstars Jennifer Hernandez, plus a special “Marvel at the Showdown” variant cover by the incomparable Brent McCarthy! 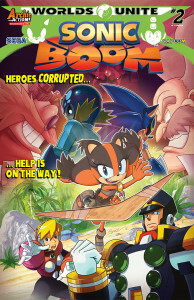 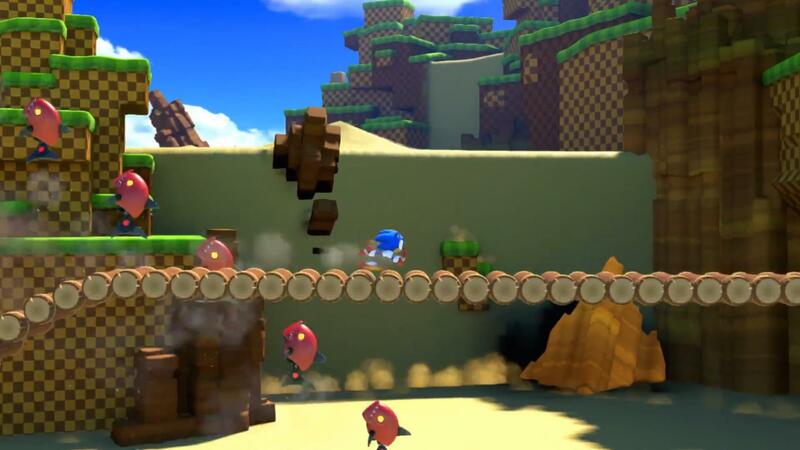 Meanwhile, we trade fighting garb for Lederhosen for Sonic Boom’s latest offering. 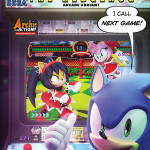 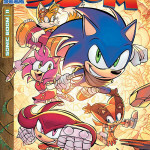 Arcade Sushi are the ones with the preview for Sonic Boom #5. 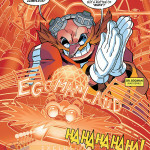 Eggman wants to manipulate the village for his own sick amusement, but how can he take advantage of them with a zero publicity rating? 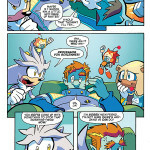 The solution to try and get into their good graces, and the answer for that to him is to throw an event for them. But he’s not going to get far with that unless he calls in the help of our heroes. 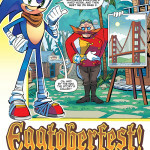 Join in the ‘festivities’ and make a trip to the fair in “Eggtoberfest”. 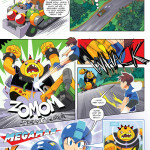 On Sale Date: 3/11 | 32-page, full color comic | $3.99 U.S. 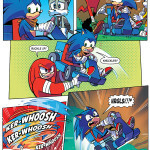 Both of these comics are already out. 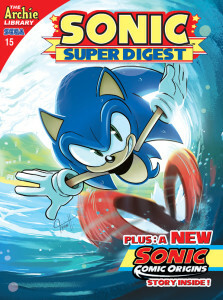 If you haven’t picked up a copy already, make a date to do so. 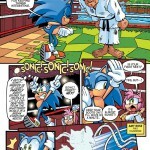 Just have it more like a nice day trip and not a fighting match. 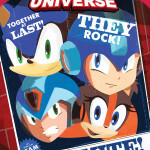 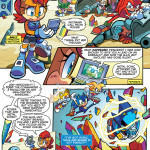 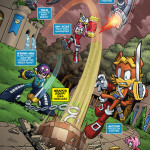 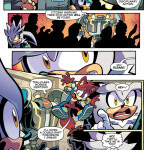 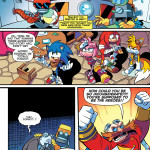 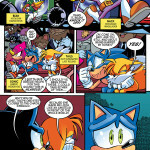 The danger in the digital world is all too real in this month’s issue of Sonic Universe! 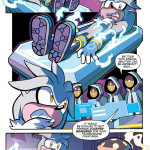 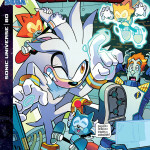 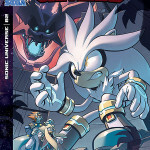 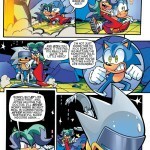 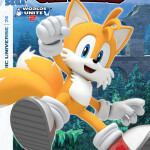 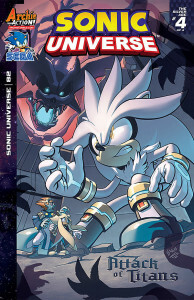 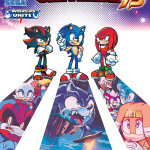 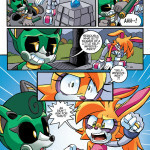 Comic Book Resources has the preview for Sonic Universe #73, and the truth hurts as much as physical pain as we see quite plainly here. 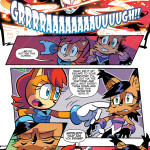 Sally uncovers Nicole’s tragic origins, and her friendship with her brings her at loggerheads with Dr. Ellidy considering the pain it’s wrought on him. 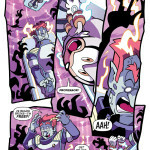 Meanwhile, Nicole herself is besieged on by the monster of megabytes, new villain Phage. 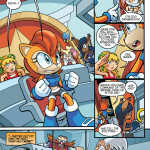 What’s her place in all of this malarkey, and can Sally and Ellidy agree to something before Nicole can be deleted? 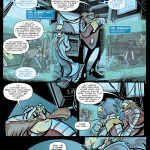 Find out in “Spark of Life”: part 3. 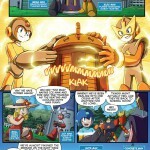 It STARTS with a SPARK! 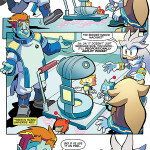 “Spark of Life” Part Three: Shocking truths are exposed as Dr. Ellidy reveals the tragic origin of the beloved A.I., Nicole! 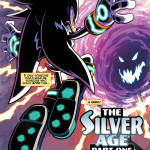 Meanwhile, Phage erupts from the shadows of the Digital World to sew chaos on the island! 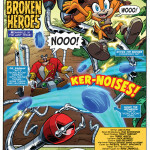 Can our heroes rally to save Nicole and drive off this new threat? 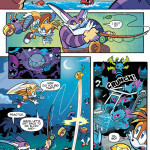 Night is falling, and terrible monsters are closing in! Don’t miss this exciting next chapter in the latest Sonic Universe epic, featuring all-new cover art from Sonic artist supreme Tracy Yardley, and a special new “EXTREME BFFs” variant cover from My Little Pony artist Agnes Garbowska! 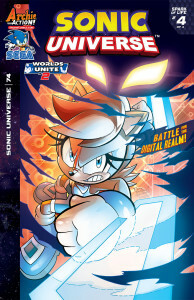 Sonic Universe #73 is out now, so be sure to pick it up to discover the next part of the digital dilemma! 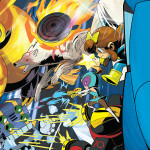 The fighters are assembled, so it’s time to get round one underway! 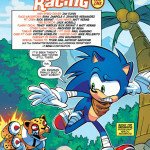 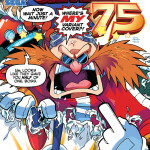 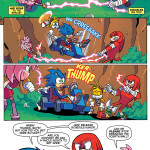 Archie Comics themselves have a preview for Sonic the Hedgehog #269, and the fists sure are furious in this months issue! 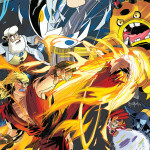 With the fighters all gathered, the tournament can commence and the blows can be dished out by the second! 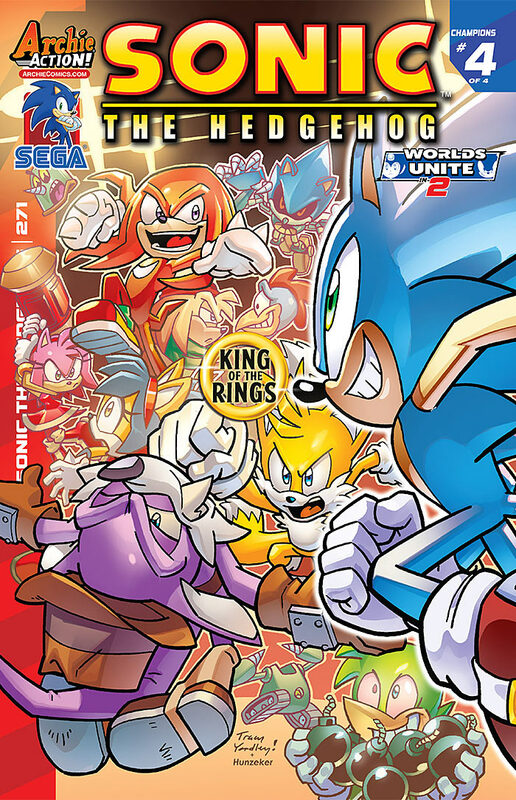 But who will triumph and progress to the second round, and who will crash out at the starting gate? 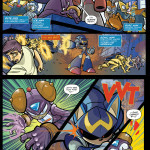 Whatever the answer to that, the baddies working in the shadows won’t let it affect their game plan. 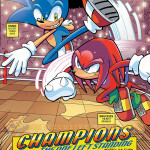 This is “Champions”: part 2. 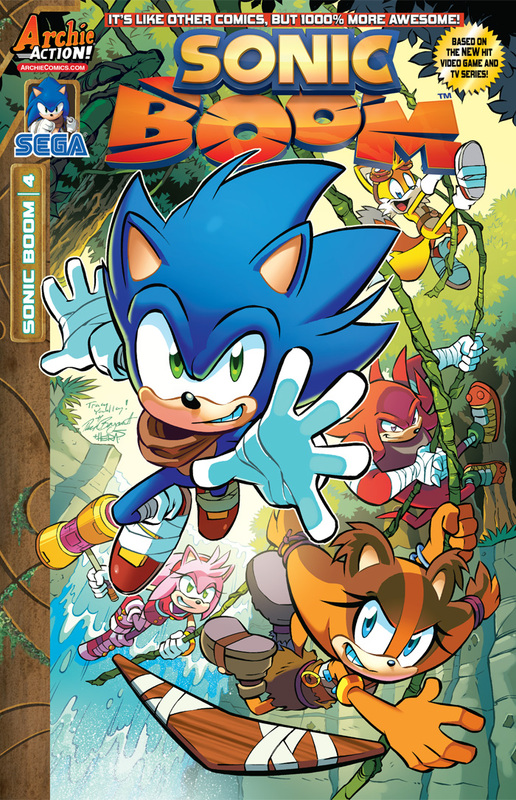 Sonic #269 is out today in stores and digitally. 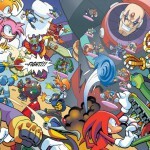 Now the time isn’t for talking, let’s get ready to rumble! 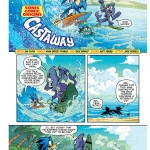 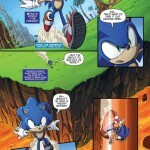 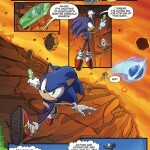 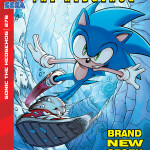 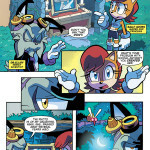 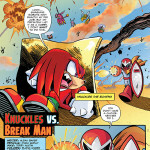 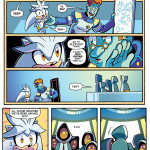 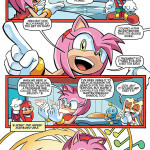 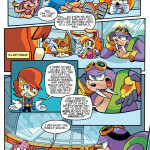 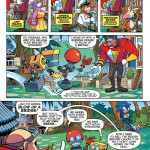 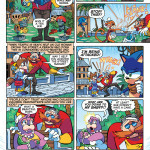 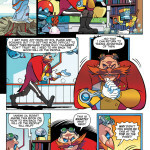 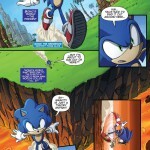 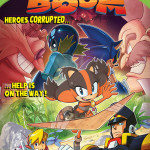 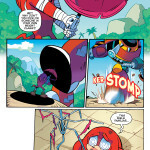 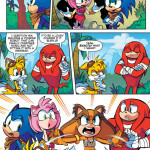 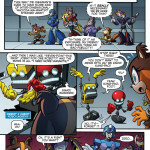 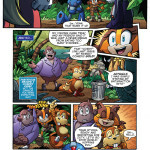 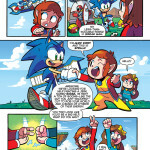 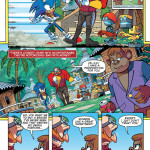 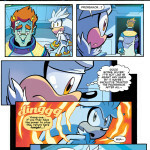 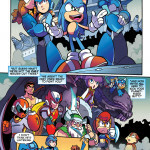 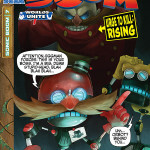 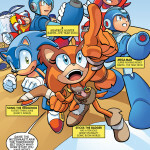 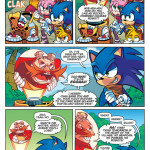 The first not-arc concludes in the latest issue of Sonic Boom. 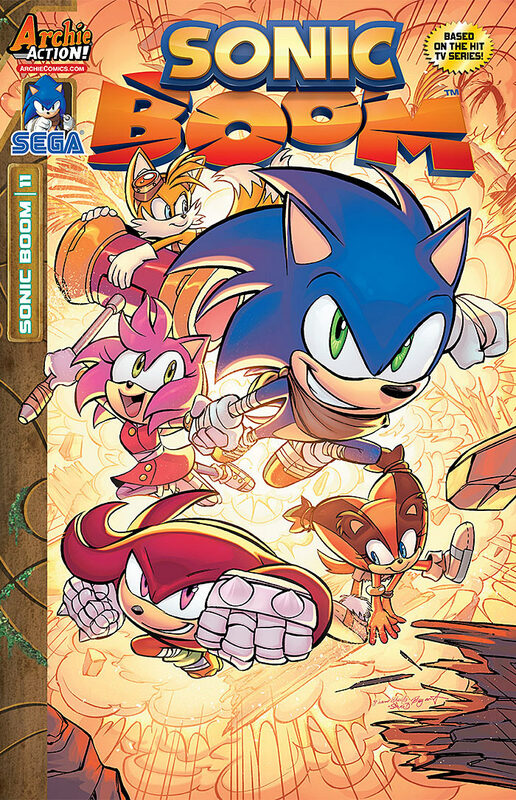 Comic Book Resources has a preview for Sonic Boom #4, and it’s the end of the beginning for our heroes. 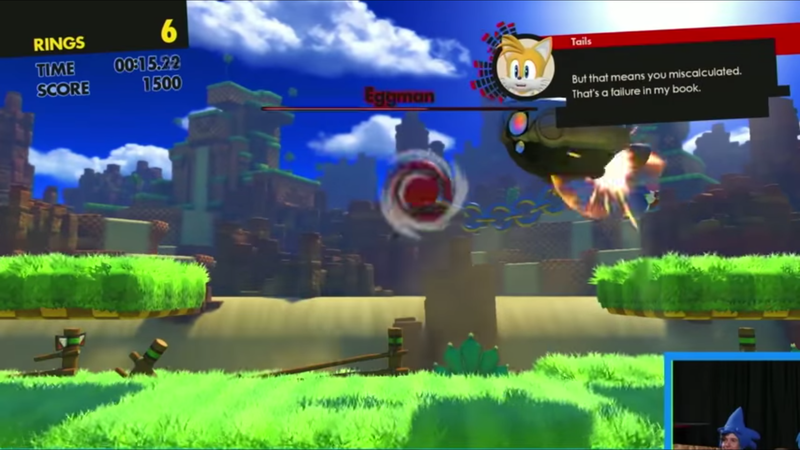 Eggman is back with his Big Boy, and this time it’s new, improved and more than capable of standing up to the old tactics of the last few fights. 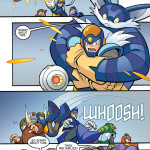 What can overcome the meaner threat? 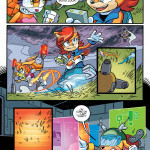 Sticks thinks she has the answer, but who knows what would happen when she puts her ideas to the table. 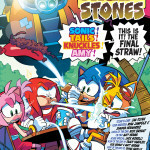 Let’s hope they don’t lose their heads as we get to “Sticks and Stones”. 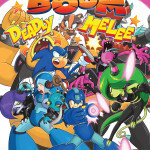 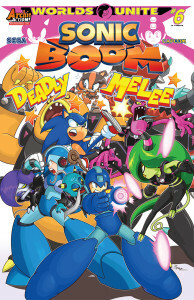 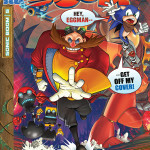 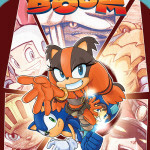 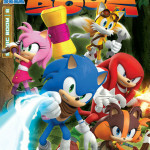 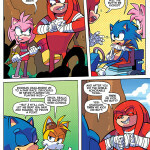 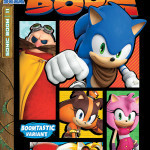 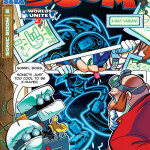 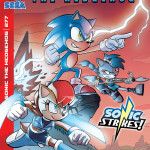 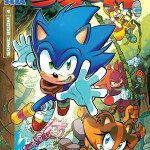 The NEW ONGOING SONIC COMIC BOOK SERIES from Archie Comics keeps on BOOMIN’ with Sonic Boom #4: Sticks and Stones! 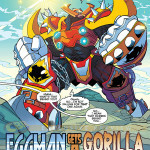 Dr. Eggman’s Big Boy mech has been refined into its final, deadly form. 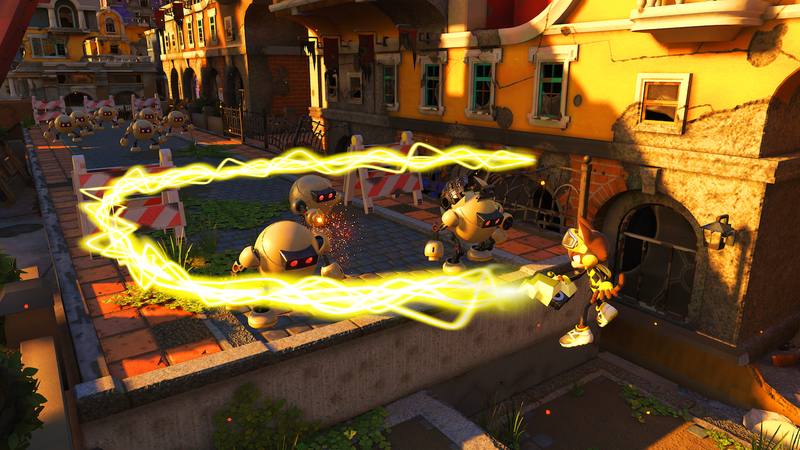 Sonic and his friends are on the ropes—but have no fear! 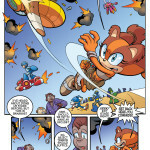 Sticks has brought her secret weapon! 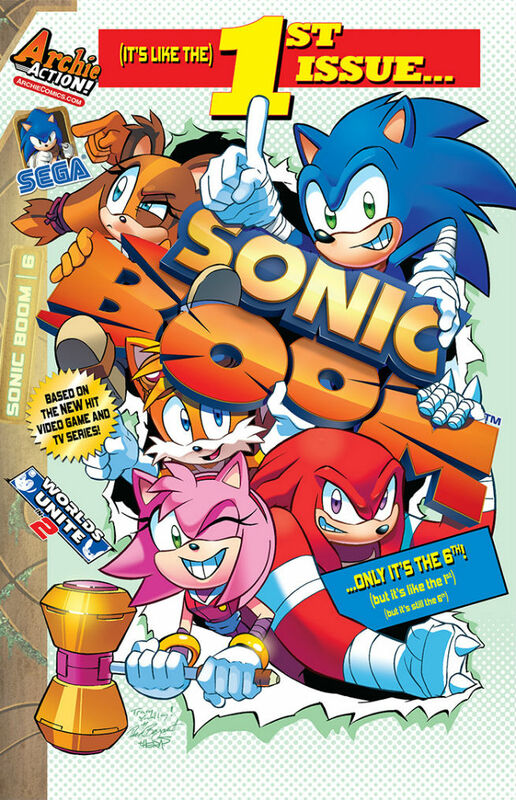 It’s a… wait, seriously? 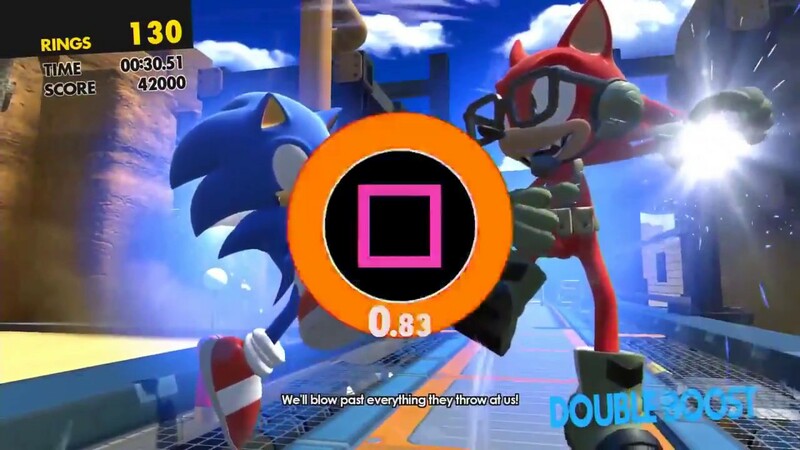 This thinks THAT’s going to help?! 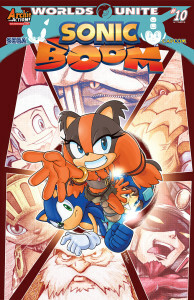 Find out what her secret weapon is in the weird and wacky conclusion to the first story arc of the brand-new series SONIC BOOM! 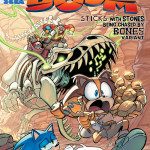 Featuring cover art from Sonic art guru Tracy Yardley and an all-new “Sticks-with-stones-being-chased-by-bones” variant cover from rising Sonic star Diana Skelly! 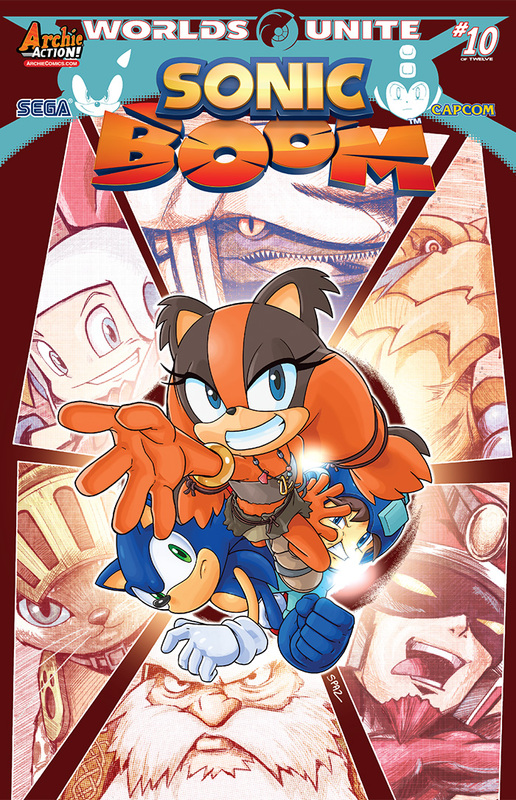 Sonic Boom #4 is already out in stores and on digital formats, so rock the boat and roll out to get a copy for yourself! 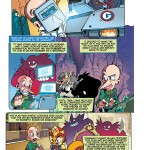 The die have been cast for an adventure in pandemodium! 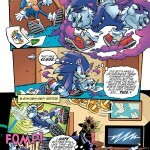 Comicbook.com has a preview of Sonic #268, and we’re starting a new arc at Casino Park! 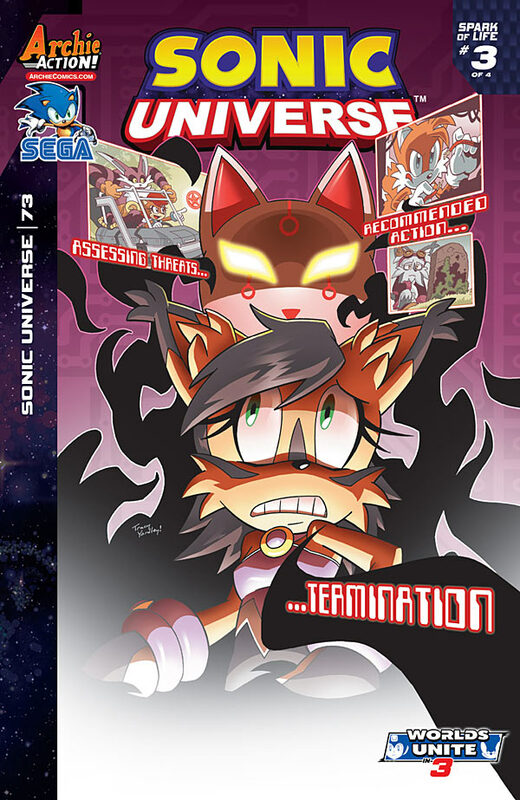 Breezie the Hedgehog; a woman with a sordid past and the Chaos Emerald that Sonic and the Freedom Fighters. 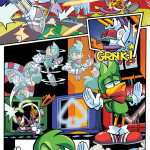 As they put their most favourable forward to earn the emerald fairly at her Fighting Tournament, plenty of other factions are in on the fight as well for numerous reasons, both noble and nefarious. 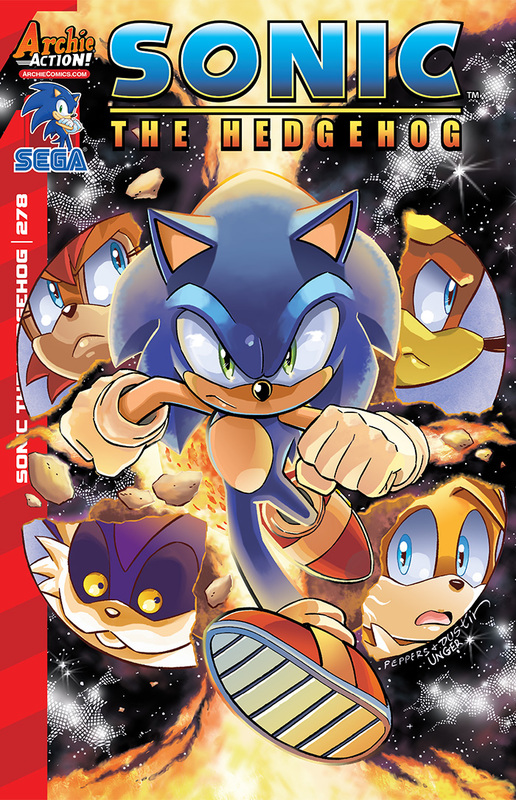 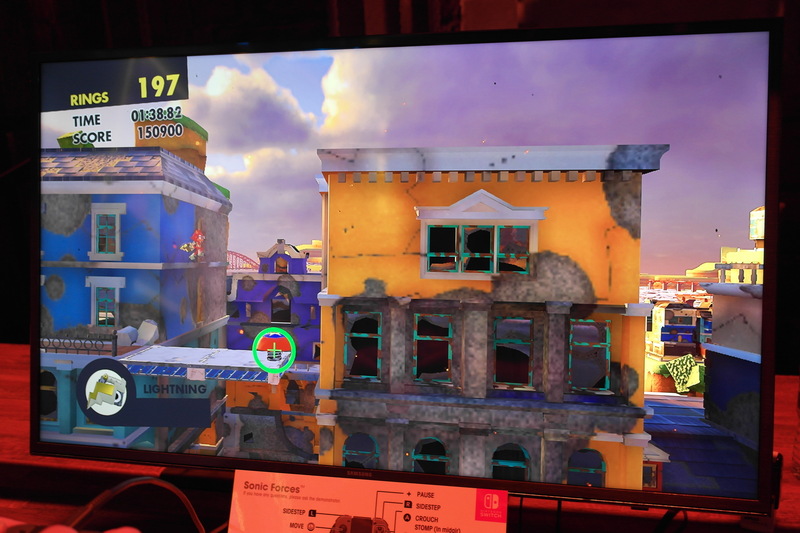 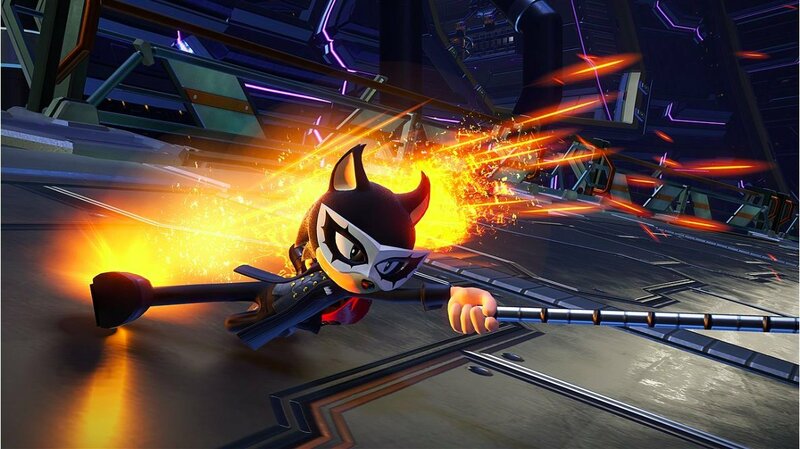 We can already tell that there’ll be adaptations of Adventures of Sonic the Hedgehog and Sonic the Fighters abound, including a first appearance that’s simply sweet as candy! 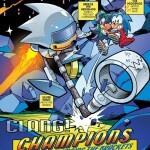 This is “Champions”: part 1. 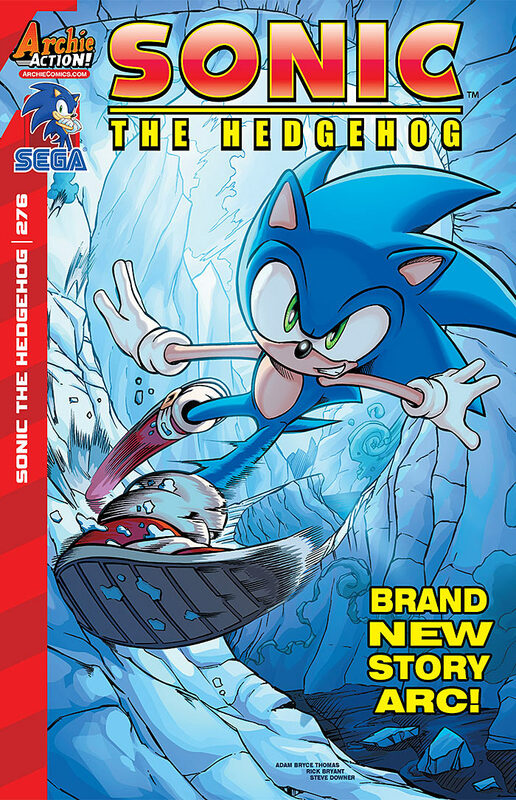 Sonic the Hedgehog #268 came out today in stores and digital platforms, so don’t leave things to chance and make sure you check it out!